EXCAVATION AT ROMAN FORUM OF POLLENTIA. MALLORCA. SPAIN. The Roman Forum Pollentia program offers a hands-on experience in excavation and laboratory at a Roman archaeological site. Those who join us at the archaeological excavation of Pollentia on the island of Mallorca will work as field crew on the ancient settlement of the city alongside professional archaeologists and students from different universities. You will be learning the methods and techniques of an archaeological excavation, using tools, of course, but also working with stratigraphy, using record sheets and writing down an excavation. diary. Collecting, cleaning and classifying different artefacts will be part of your daily work as well as drawing structures and archaeological materials. You will be introduced in the study of Roman pottery and will find out how to get from inventories and storage in a museum to exhibitions. Roman consul Quintus Caecilius Metellus conquered Mallorca around 123 BC and it is thought that Pollentia was founded between 70 and 60 BC during Pompey’s successful quest to vanquish pirates from the Mediterranean. Pollentia soon became the main urban settlement on the island, and was named a Roman colony during the reign of Augustus (27 BC to 14). After centuries of artefacts emerging during farming, in the 1920s historians began excavating Pollentia’s ruins alongside the modern town of Alcudia. They are the best preserved Roman remains on the island and they have become an important reference for the study of the introduction and spread of the Roman culture in the Balearic Islands. 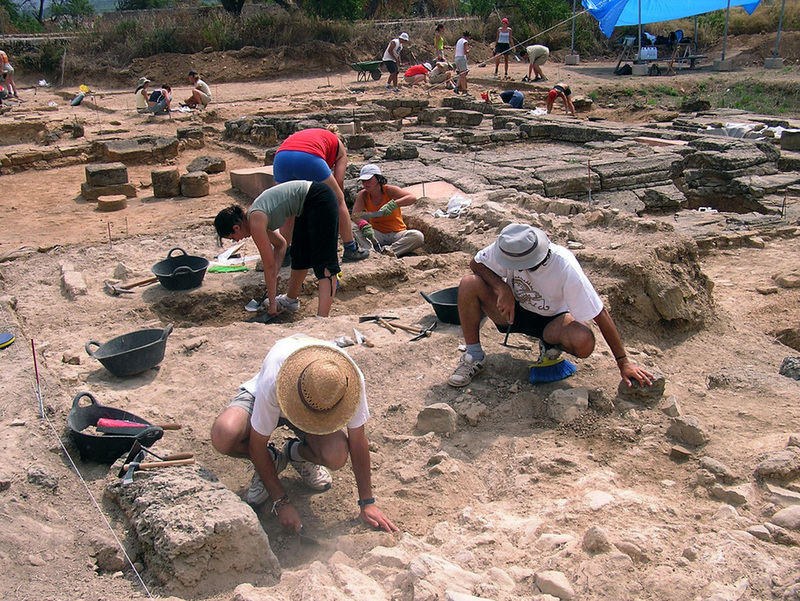 Systematic excavations at Pollentia began in the 1950s under the auspices of the William L. Bryant Foundation, a US project linked to Dartmouth College. In the residential area of Sa Portella archaeologists excavated the remains of three houses. Two of the homes bear colourful names: The House of the Bronze Head, because diggers found the bronze head of a young girl in one of the rooms, and the House of the Two Treasures, because of two coin hordes found dating to the mid 3rd century and the late 4th century. Also built during Augustus’ reign, on the outskirts of the settlement, the theatre's foundations were carved into the bedrock. Eleven rows of seats remain. Following its use as a theatre toward the end of the Empire, Pollentia’s inhabitants used the spot as a cemetery as some of the tombs are visible in the rock. The ArchaeoSpain group will focus its research and work on the Forum, the city’s public square. Over the years archaeologists have uncovered the remains of several temples, platforms and altars, in addition to an open space lined with tabernae (shops). The constant activity in antiquity in the Forum makes for a complicated but exciting archaeological project, and each year’s work helps clarify the chronology of the structures being uncovered. In addition, while in the field we will take some time out to teach everyone the basics in Archaeological Mapping with traditional tools and also using modern technology such as the total station. The group, including ArchaeoSpain staff, will be staying at Carlos V ApartHotel in the center of Alcudia, a walled, medieval town. The hotel is about a five-minute walk from the excavation and students will be sharing double and triple rooms with air conditioning. Meals will be eaten at a restaurant, and an arrangement will be made to provide us with the mid-workday snack. Next topic: "Cultural Heritage Management Field School in Cambodia "
Previous topic: "IRON AGE NECROPOLIS OF PINTIA. SPAIN"